What is happening, hopefully, in Egypt is truly momentous and it has been a long time coming, as MB says below; “When it happens, it will not have happened suddenly.” He is referring to a wider phenomenon across the Arab world, which is, I think, really the end [the real ending] of the post-Imperial age, the beginning of the beginning [the real beginning] of a new Arab autonomy and matching political culture. That is the prize. 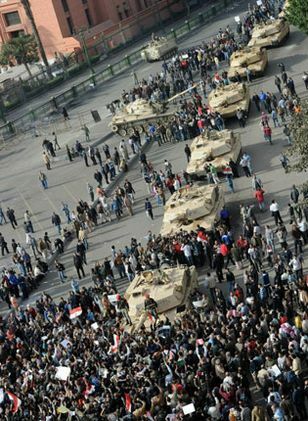 If Egypt completes its transformation, then it will be inevitable though not immediate and not in a single step. As such, it’s something that I’m only observing with respect and pleasure from just one ex-colonial capital! This line from a poem I had written two decades ago jumped into my mind when the youth of Tunisia turned their ruler from a mighty dictator into a frightened rat looking for a place to hide and, in a month of civilian protests, managed to change history. The Palestinian leadership in Ramallah, embattled after the al-Jazeera leaks revealing its co-operation with the Israeli occupation, opted to show no enthusiasm for the Tunisian revolution but could in no way condemn it as the Libyan leader Muammar Gaddafi shamelessly did. “We are not Tunis,” shouted the other ageing Arab dictators who are all fond of dyeing their hair and moustaches. But they are. And they are really shaken, puzzled and afraid. This is the first time in Arab history that a dictator has been ousted by a peaceful popular revolution that put an end to the phenomenon of the “death of politics” in Arab countries. It is also the first fully successful popular retaliation against the politics of humiliation that have been endured by the Arabs since the colonisation of their countries. The real motivation behind Muhammad Bouazizi’s self-immolation was dignity rather than hunger: he was slapped in the face and he was unable to hit back; the Tunisian people did it for him. For the past century or so every ingredient of political life has been faked, sovereignty is not sovereignty, parliament is not parliament, law is not law, and the opposition parties are as corrupt and wasted as the ruling party. Even independence, since colonial forces handed power to local dictators, was not independence. What happened in the Tunisian revolution is valuable for the modern history of the region, but equally important are two elements that were absent: no opposition party, including the Islamists, could claim sole credit for it; and the army could not redirect its energies to bring about a coup. How is this affecting Palestine? The current leadership of the Palestinian Authority decided to put all its eggs in the American basket, unaware of the constraints on American power in the region, as evidenced by events in Tunisia, Algeria, Yemen and, most importantly, Egypt. They have no alternative and no strategy other than total dependence on the United States; hence the Palestinian people will find an alternative to that policy and eventually an alternative to that leadership. The Palestinian Authority is selling out on all inalienable rights of the Palestinian people, while at the same time granting contracts to Blackwater mercenaries to subdue its own people. It is an authority of occupation by proxy, and Palestinians, inspired by Tunisia and hopefully Egypt, are likely to take matters into their own hands. Throughout the Arab world, popular intifadas may be long, painful and costly, but it now seems inevitable. When it happens, it will not have happened suddenly. Mourid Barghouti is a Palestinian poet. The whole series ‘After Tunis: Arab Writers Reflect’ is here.